Gas Powered Tree Pruner Details - Quasius Equipment, Inc. The Husqvarna 525PT5S gas power tree pruner combines a professional power head with a chain saw drive head and a telescoping pole. The 12" cutter bar and chain assembly is fed by a telescopic pole that extends up to 13'-3" for reaching out and getting at those hard to reach branches and limbs. 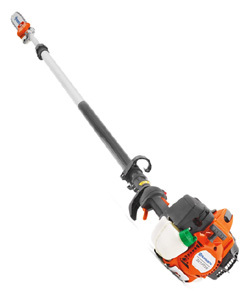 The professional Husqvarna power head provides plenty of power yet is light enough to handle easily. Standing on the ground branches can be cut at the 16' range or if working from a boom lift or other raised platform you can trim anything that you can get within 16' off vertically or 13' horizontally. It is powered by a 2 cycle engine which requires mixed fuel and oil so we will provide you with plenty of fuel mix, as well as bar oil, at no charge to ensure you get your job done without worrying about mixing fuel. Telescopic Pole Length - Up to 13' - 3"
Collapsed Length - 9' - 6"